I started them on a whim more than a year ago. 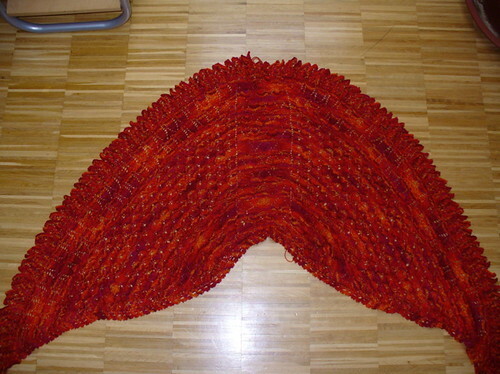 The pattern is Tiffany by Sabine Riefler. I used leftover yarn from a crochet scarf, and in their first incarnation they looked completely different. I had to frog them since they were a) way too big for me, which wasn’t much of a problem since my husband said he’d like them, but then I b) ran out of yarn. I ripped, I started a doll’s sweater with the yarn, I ripped the sweater, I read a bit about doing two-handed stranded knitting, I tried again on tiny, tiny needles, and there they are. In two-handed stranded knitting you’re holding one color of yarn in each hand, and you knit continental with one hand, and English with the other. It was very weird at first, especially since I had to modify the way I knit continental, too, since usually when I’m knitting I’m using both hands. In this case I had to free my right index finger. At first I felt like wearing handcuffs, and my right hand hurt but in the end it got easier and more comfortable. And I really love the way the knitting looks and feels, and most of all that there are no strands on the inside. Someday I will make a whole sweater using this technique, I’m sure. By the way these are all crappy photos because it’s still grey in grey here. 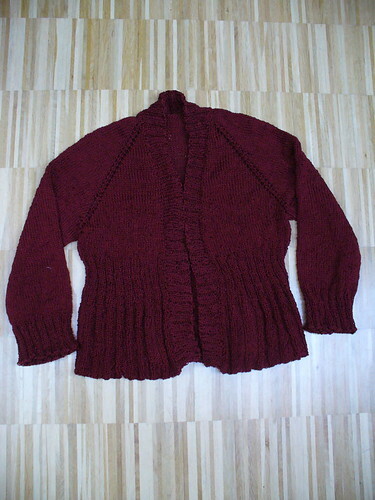 Then there’s the cardigan that I started last year in June. It still needs washing, blocking, and a button. 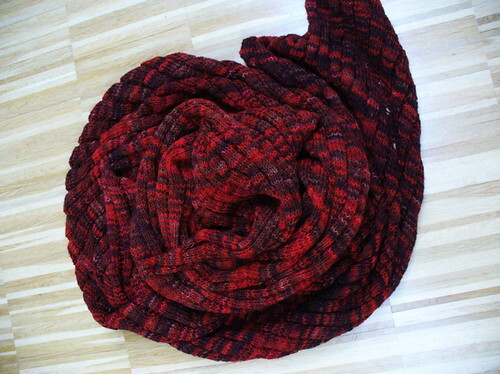 It looks really crumpled because the yarn used to be an almost finished bobbled and cabled sweater that lay in the attic for something like 14 years. It survived the big de-cluttering of 2004 only because I like the color, and I thought that it might become a new sweater eventually. 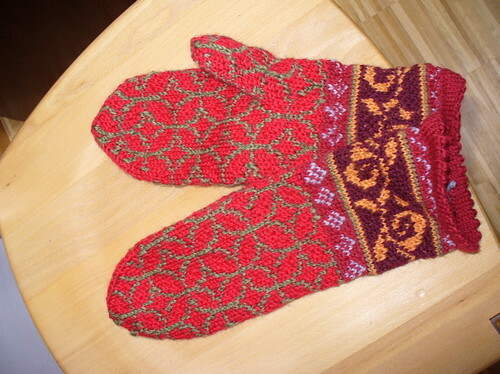 Last year when I saw the pattern Something Red by Wendy Bernard I wanted to make it immediately, and I thought about the yarn in the attic. So I unraveled the bobbled monstrosity, wound up the yarn and re-knit it. No, I didn’t wash the yarn first. Silly. I’ll have to wash and block the finished thing anyway. I made it a bit too small because I think the cotton will become bigger with wearing. This will either be something that I wear all the time, or something that I don’t love at all. The knitting went really fast, until I got bored with the plain stockinette, and with the cotton (because I really don’t like knitting with cotton). I have this feeling that maybe my knitting basket dooms project because the cotton sweater sat in there, only lacking one sleeve for months, and months, and now I have started a new sweater which lives in the basket, and again I am both enthusiastic, and reserved. We’ll see how that one turns out. Much better. Also needs blocking, of course. If I go on finishing things at this rate, and not blocking them I will need a special closet for “things to be washed and blocked”. Right now they are blocking both of our dressers. Ahem. The pattern is Ornette by Cookie A. I love the intricacy of her patterns and also the fact that she named so many of them after Jazz musicians. I will have to knit a Thelonious Sock eventually because Thelonious Monk is one of my favorite musicians of all times. 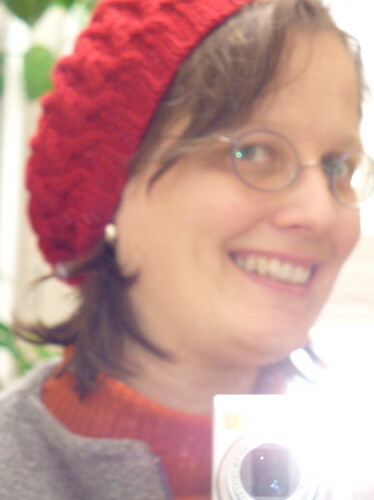 You can find a picture of the bigger one here, and there you can actually see the pattern of the hat. I really love Ysolda’s designs, they make me very happy. Again with the crumpled look because again, not blocked. Which is why you can’t really see how beautiful it’s going to be. In my defense I have to say that the drum set is sitting on the rug that I use for blocking. But who knows, maybe someday I’ll block everything, and then the sun will shine, and I’ll show you even more pictures of knitting in reds. 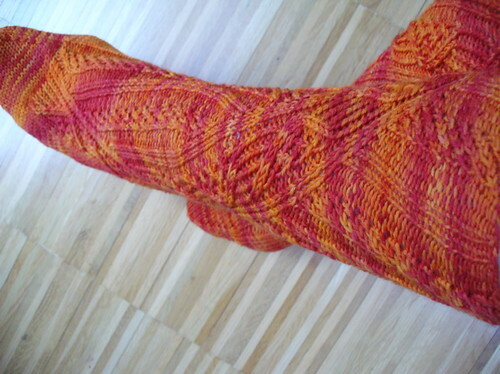 For those few of you who’d want to read even more about my projects, you can find me on ravelry. And of course I already started three new projects, or rather four, a pair of plain socks to take with me when riding trains and such, a little doll designed by Ysolda for my son, an olive green turtleneck for me, and a lace stole. Not that much, don’t you think? how do you wash yarn? I have an interesting, colorful poster from an Ornette Coleman concert that might inspire you when you are taking a break from your red phase. De, washing yarn is a bit tiresome but you better do it when you spin your own. You wind it into a skein (either with around your hand and elbow or if you’re fancy you use a niddy-noddy), you tie it so that the skein stays a skein (very important step you don’t want a wet tangle), then you immerse it in lukewarm soapy water, then in clear water so that the sopa comes out again, then you can put it in a towel, and hang it up on a hanger over the bathtub or such where it drips for a day or two. then you have a nice fluffy, kink-free yarn. So far my red phase has lasted about all my life. I like other colors too, only blues don’t appeal to me at all. i admire you. How can you be so patient to do such beautiful things?